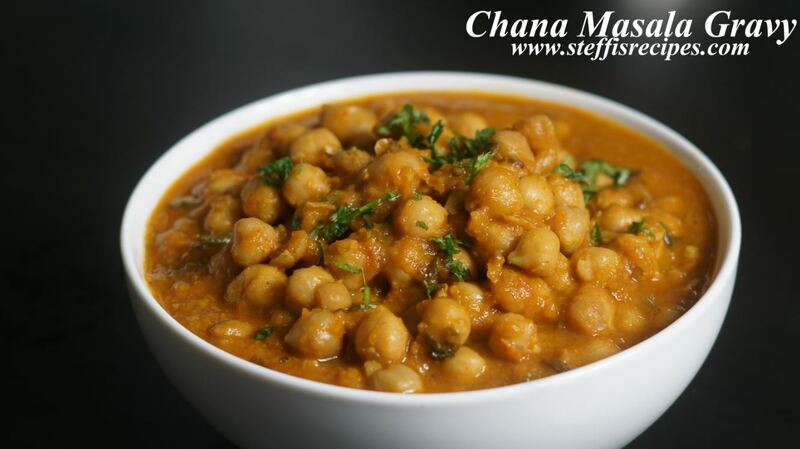 Chana Masala is an excellent gravy recipe which goes well with Poori, Chapthi, idli and dosa. This recipe is very nutritious because it is made with Chickpeas / Konda Kadalai . This recipe can be with both black chickpeas or with white chickpeas both tastes good. Step 1) Soak chickpeas for 8 hours and pressure cook it for 4-5 whistles on a medium heat with some water and some salt. Heat oil in a pan and add onions and saute if for some time, Once the Onions turns translucent add Ginger , Garlic and the masalas - Turmeric powder, Cumin powder, Garam masala, Coriander powder, chili powder and dry mango powder. Also add some water to prevent the masalas from burning.Finally add tomatoes , cover and cook for 6-7 minutes or until the raw smell of the masala is gone. Once the raw smell is gone turn off the heat and allow it cool. Once cooled grind it to a fine paste. Mix well and cook for 5 minutes. Mash some of the chickpeas with a masher or with a backside of a tumbler to thicken the gravy. And cook it for a couple of more minutes. Finally Garnish it with chopped coriander leaves and turn off the heat. That's it our delicious Channa Masala Gravy is ready to be served with Chapathi, roti and lot more. Please do try the recipe and share your feedback. Happy Cooking and Spread the Joy of Cooking !! !